Hello my friends! I think I’ve finally finished one room in my new house! 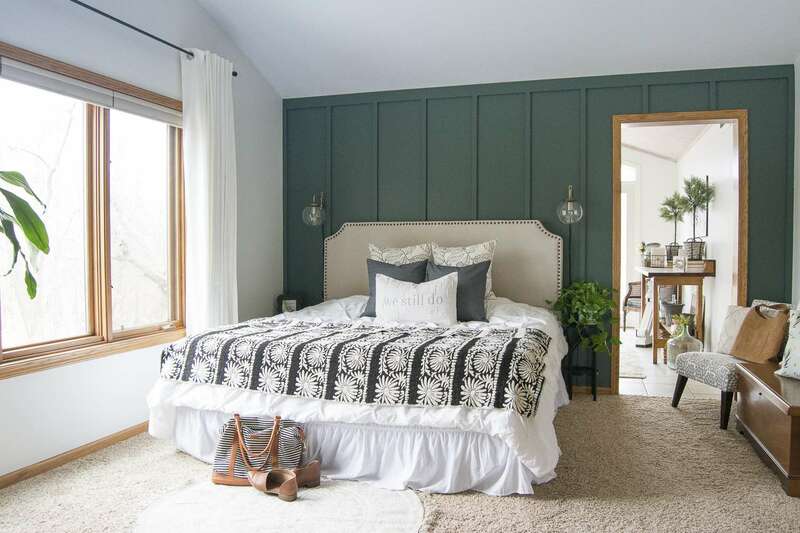 😉 I showed you a little sneak peek of my modern farmhouse bedroom retreat here with my DIY accent wall and now I’m ready for the full reveal! 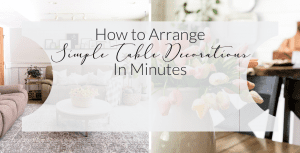 Sometimes a room just needs a few simple finishing touches to really make it cozy and I feel like I’ve accomplished that with modern farmhouse bedroom decor! 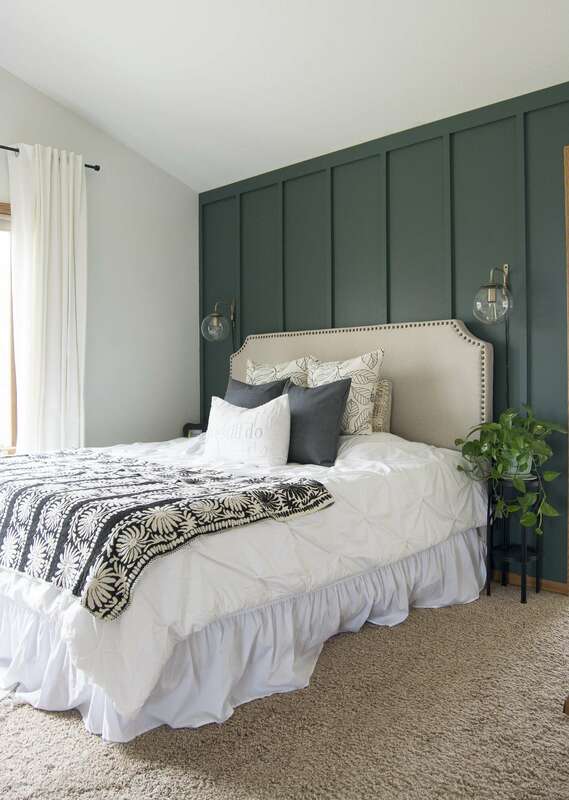 The key to making this modern farmhouse bedroom decor cohesive was to stick with a neutral palette and invest in some fun finishes, textures and bold accents. So here we go! Our new home has a very different feel to it than our previous home. 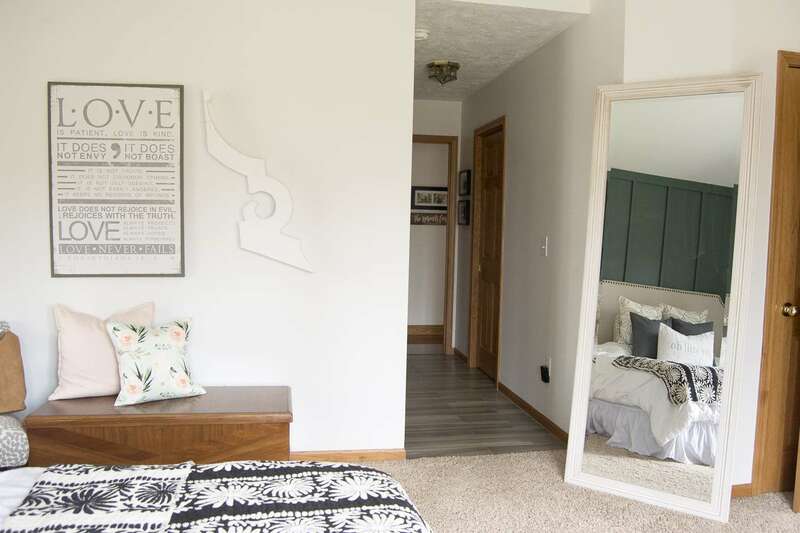 The first room I invested some design time into is our master bedroom and I revamped it for a more modern farmhouse feel. 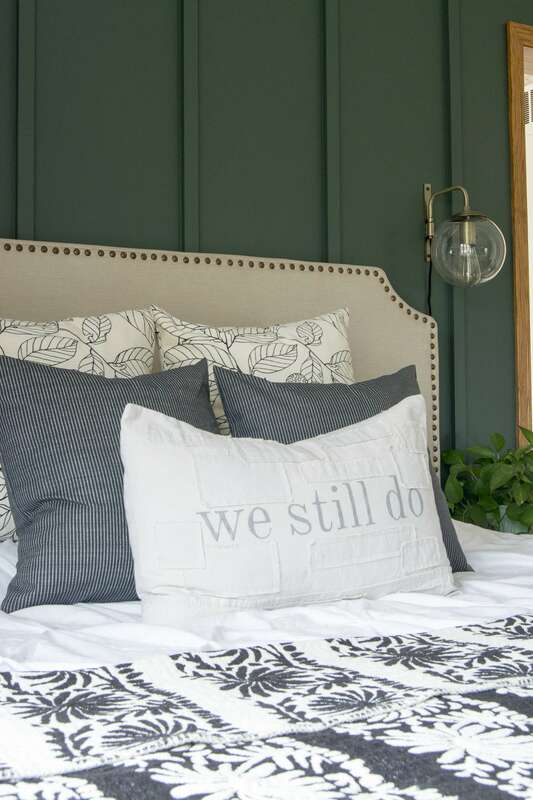 I reused the majority of our old decor, including the pleated comforter, upholstered headboard, and wall decor. Next, I shopped my house for some easy additions like our old dining room curtains and living room pillows. To up the comfy factor I scattered pillows around like confetti. 🙂 Nothing says comfy like a million pillows. 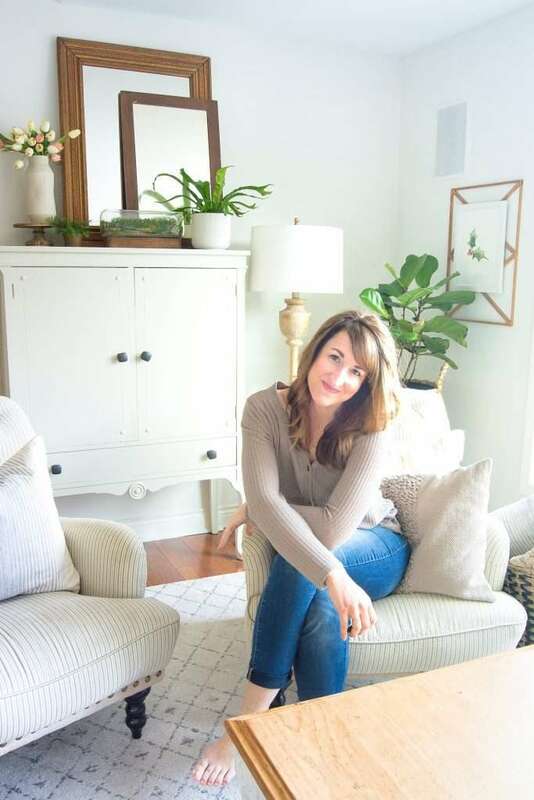 Once I had everything I already owned worked into the space I went shopping for just those few finishing touches I was looking for to complete the space. I knew I wanted some wall mounted sconces because the wall space didn’t allow for large nightstands on either side of the bed to hold lamps. I was excited to find these sconces that added that touch of modern to the space and didn’t need to be hardwired! Next, I wanted to add some drama with bold prints on the bed. This beautiful reversible bed throw was exactly what I had in mind to heighten the design of the room. It is soft, heavy, and a great focal point for the bed. Plus, it was easily coupled with some simple linen throw pillows in black to anchor the space. Finally, the bed needed this beautiful We Still Do pillow with all that yummy texture. 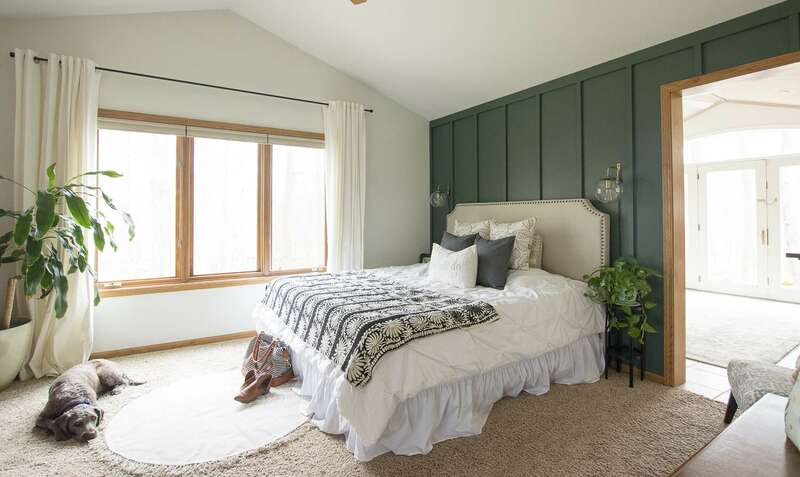 One area that is easily overlooked in a bedroom is the floor! 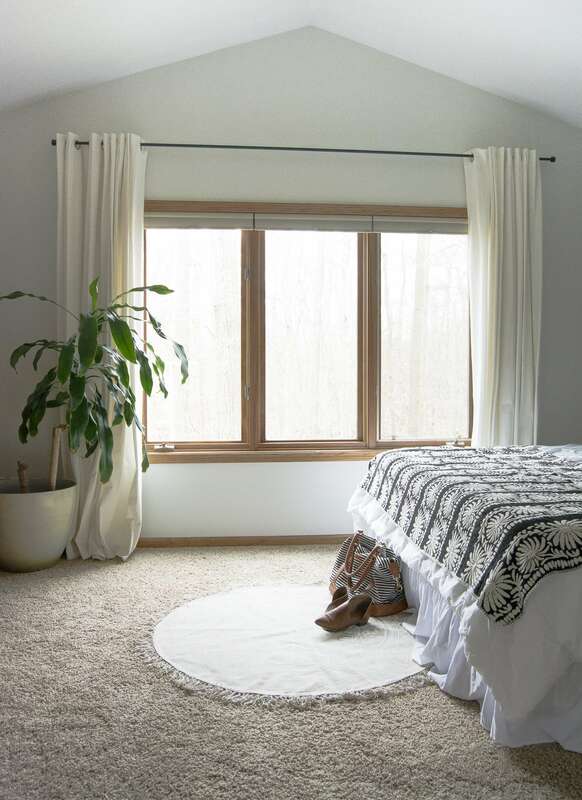 This beautiful round cotton rug adds just a touch of neutral boho design for some contrast with the rest of the modern farmhouse bedroom decor. 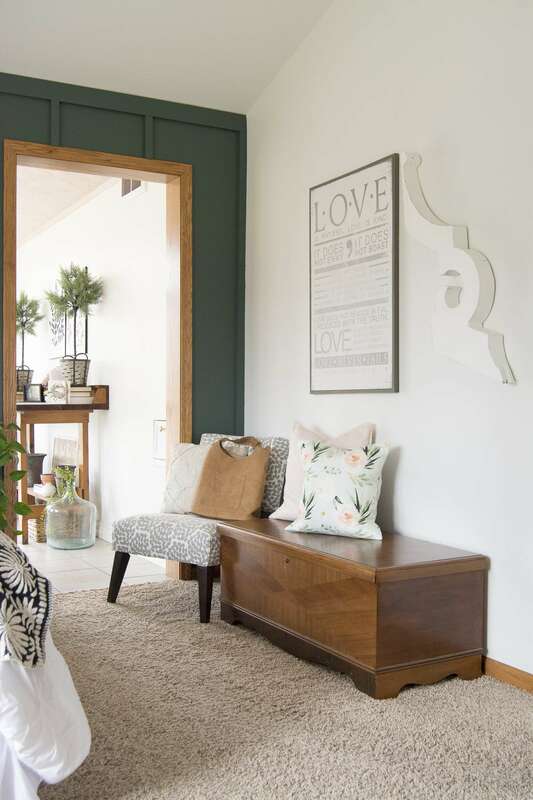 To tone down the modern boho vibe I, of course, had to add some farmhouse. 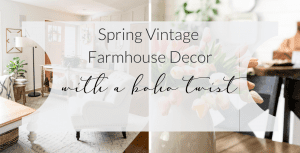 It’s hard to go for modern farmhouse bedroom decor without the farmhouse part! 😉 To do that, I added some signs and wood accents to the walls. It pairs nicely with the hope chest my grandpa refinished for me. Finally, to finish off the space I had to add some life with plants! 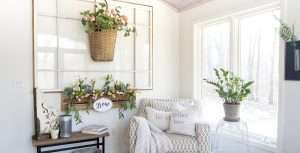 Pothos are simple to grow and add a bit of livelihood to a room that regular decor lacks. The plants also give a nod to our attached sunroom that I’ve claimed as my office which you can read all about here! What design style do you lean towards for your master bedroom? Are you a straight farmhouse kinda gal? Boho? Eclectic? Traditional? I’d love to know what you’re loving right now! Leave me a comment below! 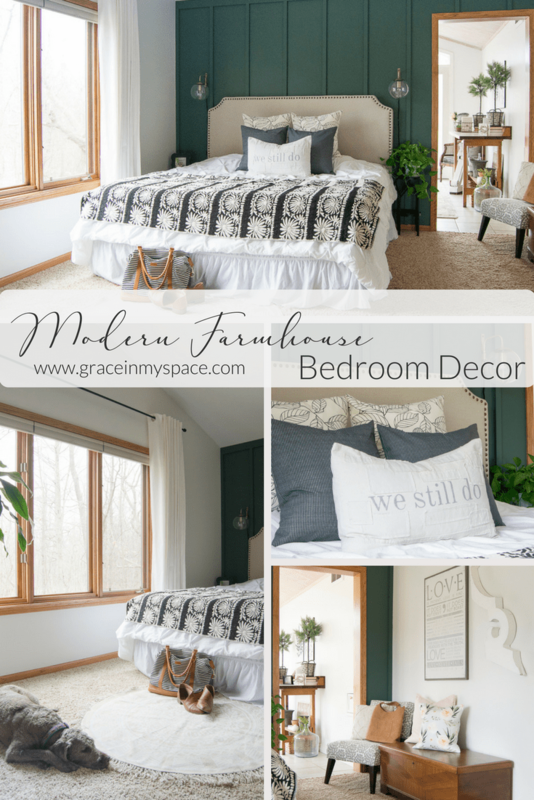 Thanks so much for touring my modern farmhouse bedroom decor updates! You can shop the room by clicking the affiliate links below. Be Blessed! Can you tell me what upholstery you picked for your headboard? Is it bone or sandstone? Thanks!! It’s beautiful and exactly what I’m going to do in my bedroom! So fun!! I’d love to see a photo when you’re done!